A few of our recent press releases and downloads can be found below. Why does your business need SIEM? Get ahead of cyber threats with advanced detection and a unified view of your IT security. Download our SIEM product flyer as a handy reference to share with colleagues. 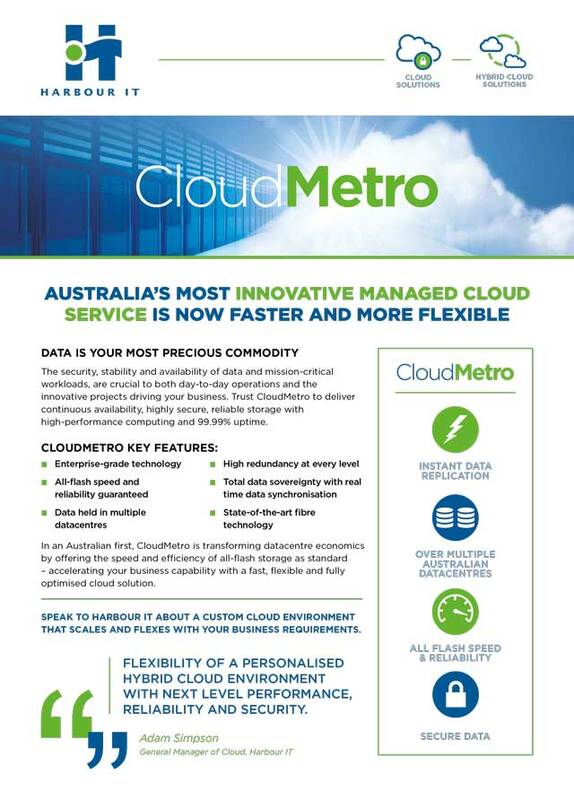 Australia’s most innovative managed cloud service is now faster and more flexible. Read how CloudMetro can provide your business with instant data replication, all-flash speed and state-of-the-art technology. Trust CloudMetro to deliver continuous availability, highly secure, reliable storage with high-performance computing and 99.99% uptime. Learn more about using the Cloud for delivery of infrastructure-as-a-service (IaaS) in our latest whitepaper, developed in partnership with CIO. This 31 page report provides practical advice from experienced cloud analysts and managers on how IT and business leaders in midmarket organisations can best prepare for, and transition to, infrastructure hosting in a Cloud environment. How does Hybrid Cloud work? Learn about Harbour IT’s Hybrid Cloud solution in this infographic. See how we’ll help you keep mission-critical workloads and sensitive data in a secure, high-performance environment whilst simultaneously leveraging public cloud services.